Mongolia has banned a total of 17 North Korean vessels from using the Mongolian flag of convenience since the passing of resolutions 2270 and 2321, according to its latest UN Security Council (UNSC) implementation report. The figure however is up from the 14 vessels it said it deregistered in its previous report for UNSC 2270 dated July 11, 2016. “Mongolia is a landlocked country. It has over 400 foreign vessels carrying the Mongolian flag on the high seas,” the report, dated March 27, 2017, read. “There had been some DPRK vessels carrying the Mongolian flag before Security Council resolutions 2270 (2016) and 2321 (2016) were adopted. Upon the instruction of the Ministry of Road and Transport of Mongolia, 17 vessels were deregistered and their contracts were terminated,” it added. 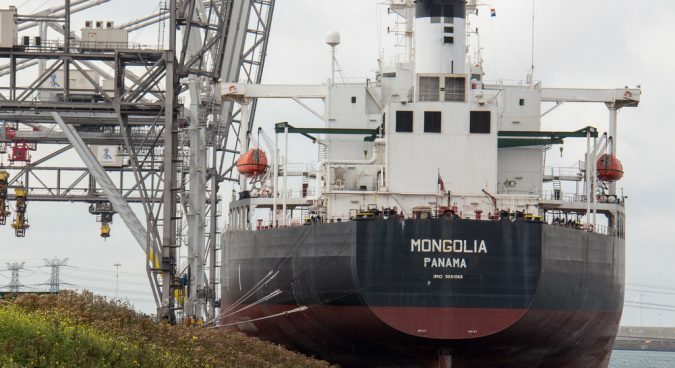 The language is almost identical to its 2016 report, other than the increased number of deregistered vessels and the omission of a statement claiming that no North Korean ships were using Mongolian flags of convenience. “Upon the instruction of the Ministry of Road and Transport of Mongolia, 14 vessels were de-registered and their contracts terminated,” it read. “Today, there are no Mongolian-flagged vessels from the DPRK”. There is no such statement in the 2017 report for resolution 2321. In the maritime industry, the practice is known as using a “flag of convenience”, a system which allows companies to register vessels in other countries. The practice is relatively common in shipping, though it is a tactic that North Korea-linked businesses and ships often use to disguise their origins. Resolution 2270 – adopted on March 2, 2016 – calls “upon the Member States to de-register any vessel that is owned, operated or crewed by the DPRK,” paragraph 19 reads. Although Resolution 2270 included a related provision to the de-registration of vessels, Resolution 2321 strengthened the wording around providing North Korean vessels with flags of convenience. “All Member States shall de-register any vessel that is owned, controlled, or operated by the DPRK, and further decides that Member States shall not register any such vessel that has been de-registered by another Member State,” paragraph 24 reads. “Analysis of North Korea’s fleet in April indicates that no active vessels are currently using Mongolian flags, apparently corroborating the government’s claim,” Data and Analytics Director at NK News, Leo Byrne, said on Thursday. “The renewed focus on the North Korean flagging practices seems to have made even shady shipping registries more wary of providing these kinds of services to DPRK linked ships. But traditionally North Korea has circumvented such measures by setting up new companies and networks. We shall see if the game of ‘whack a mole’ continues into 2017,” he added.